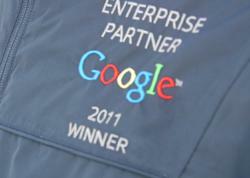 Google's new Premier Accreditation, makes it easier for Enterprise to recognise the most skilled Google Apps partners. After a recent meeting with Amit Singh (Google VP Enterprise) in Mountainview, I have total confidence in Google's Commitment to channel, commented Michael Carter (CEO). AppsCare® powered by Netpremacy Global Services announced today that it has become the Premier Enterprise Partner of the Google Apps™ suite of communication and collaboration tools. This new accreditation from Google confirms AppsCare’s position as an established and experienced partner across the globe. The accreditation enables customers to instantly recognise a partner’s expertise when planning, deploying and supporting Google products. AppsCare® has moved from Authorized to Premier Partner status based on their experience and success in deploying Google Apps for Enterprise. AppsCare® comprise 10+ years experience deploying technical solutions for organisations of all sizes and geographies utilising our GStall delivery methodology and AppsCare support programmes. From a single site organisation, through to a global corporation spanning all time zones, we have the worldwide presence, in house pedigree and experience to take projects from concept design, through to a fully supported and working deployment. Our engineers were some of the first to achieve both Google Apps Certified Deployment Specialist (GACDS) and Enterprise Change Management Mastery, providing unrivalled expertise within our customer care teams. Gstall provides a deployment framework, which is applied and further adapted with our global technical experts, to help Enterprise successfully transition to Google Apps. AppsCare® are proud to be recognised as a world leader in the deployment and support of Google Enterprise services.